stunning background in the first picture. the colour of his outfits are nicely balanced, love the tightness. I think the Jill Sander-esque coat is by Acne. Nice. i’m really into skinny khakis this season – i’d love to see you post some pics of women in unconventional twists on classic pants! stockholm style looks, as always, directional and understated. He looks like he’s right off the set of Madmen . . . Love it. Love the blue blazer and the way it it fits. I know not everyone can pull this off but he looks great in it. I think I’d like that blue sweater a lot more if it was peeking out from under a coat. Love his “clean” 1950s look. i think this guy just need a moustache to be perfect! it is all about proportions! The blue jacket has a softness to it-looks like it's made of felt or fine velvet. Note to self-start matching jacket & socks. That guy works in the Acne store in Stockholm. Dig his style! Top pic is taken close to the restaurant Riche on Birger Jarlsgatan…..I work on that street a couple of meters up towards Stureplan. I’m going to have to try a girly version of that first look. Love it. I adore that bold blue blazer. It really makes a statement, without being annoying. He works at Acne, and is one of the coolest guy of the crew ! Love the blue jacket in the first picture by the way! What of the coolest looks I’ve seen! At least that fit my personal taste. Who made those khakis? They’re absolutely amazing. I really would like to see more men wearing ascots with very contemporary selections. 8/10. simple, yet fixating. amazing what slight discoloring of the socks can do. I really love that shade of blue- and I love the pants paired with the shoes! Pic #2 – Much, much better. Interesting how the material is played with. He’s not neccessarily skinny but the tight jacket is flattering. Something to think about. Yeah, it’s true. The shape and proportion of their cloths is really unique! The oversized-trend you see nowadays is definitely inspired from the people in Stockholm. Am I the only one who finds the fit of the pants in the top photo extremely unflattering? I really do think PeeWee’s trousers fit him better. I like the lower photo. However, I think that the model cannot wear the jacket in the upper photo with the coat in the lower one. Lastly, the shortness and tightness of the trousers would work better with dress boots than with low-vamp loafers. The blue jacket is an exaggeration of the short “Ivy” jackets of the late 1950′s and early 1960′s. Great hue of blue! Too cool for school, gives me the feeling of a modernised twist on vintage. love the cravat / smoking scarf. Love the bleu coat. The fit is perfect. This gentleman has great style. C’mon. That blue jacket is way too small for him. Gives the LOLs though! What’s cracking me up is that the blue garment in the top photo appears to be not a coat or blazer, but, in fact, a cardigan sweater styled like a blazer. Is it not a knit? I can’t tell you how much I want one. Does anybody know what it is? Why don't you agree on that they have a better body proportion to be taken advantage of ?! that's why I don't find H&M looks as appealing on the American as on the Swedish. Another place that comes to mind that is obsessed with shape and proportion is Helsinki. I’m not completely sold on this look though. Not nearly enough people still sporting the ascot. Its a great look, I hope it is on its way back! Khaki Crusader – the model looks more like a Swedish Glenn Beck. I just love Stockholm and its fashionable inhabitants. Very much my style as well. This guy is called “the bomber” [bombarn] in Stockholm. I love the way both of them have played with the classic chinos-shirt-jacket combination to create something which looks quite individual. I’ve been feeling the khakis for spring as well! It’s been a LOOOOOng while since I put ‘em on my body. No more! They’re back, styled ’50s, Mod, or Nautical — fresh again. The trousers fabric in the first pic not so great… but the ‘obsession’ is there! Second picture, great outfit (same trousers?!). he is really handsome. adorably chic. i agree… he would be perfection with a moustache! The top look is really hard to pull off without the right build–this guy makes it all work seamlessly. I really like his shoes, tassled loafers have such a clean look and his are especially sleek and expensive-looking. 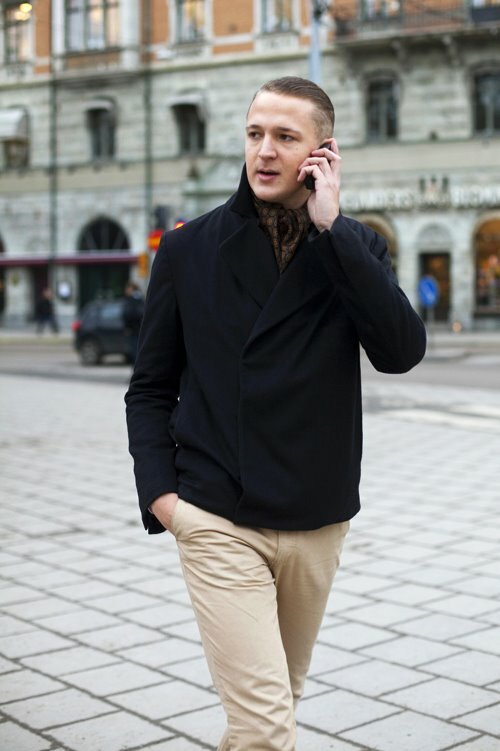 The lower shot is the proper way a short coat should be worn, with streamlined pants. Genius–great job, Sart. The jacket on top is also by Acne; it is the Saint Martin Fleece jacket and is made of “Japanese cotton fleece.” I got mine at hejfina in Chicago and am a little nervous about sporting it because I’m not particularly skinny. It is wonderfully soft and flexible like a sweater, but cut like a blazer and seems to hold its shape well. I think he pulls it off nicely. I wished more guys would dress like this. Wow I absolutely love it! Ascot is a interesting touch, do you think they will catch on again? Oh I miss my swedish men! And yes we are not a colourful people but we do have style! Oh I miss that style! I really like the bright blue jacket. Unexpected, but I think it works. swedish men have got it going on, obviously! in the past year, stockholm has fast become my new ‘wish-list’ destination! people there seem to dress fabulously. The blue is fun, but those clothes simply do not fit correctly. Buying one size too small is not a substitute for tailoring. wait where are those khakis from? anyone have any similar ones? That’s my type of city! I noticed that from most of your shots from Stockholm. The first picture makes me think that if he waked down any street looking like that he would be hit on by half the male population. Or maybe 10% of them. He looks totally different in the second pic. Older! In a good way. Very chic. does not anybody find the style of the first picture dangerously evocative and nostalgic?? ?or is it just me? I love, love, love the first outfit. Everything is so well put together. Also think the jacket in the second picture is fantastic. Stockholm has style, has modern style, has not colour but has perfect style. 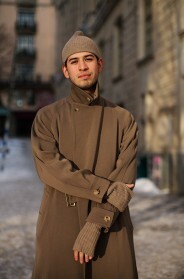 I really love how people is dressed in Stockholm. I love the first picture! Except the socks. I think he could’ve picked a better one. Maybe something brighter, or something with prints.